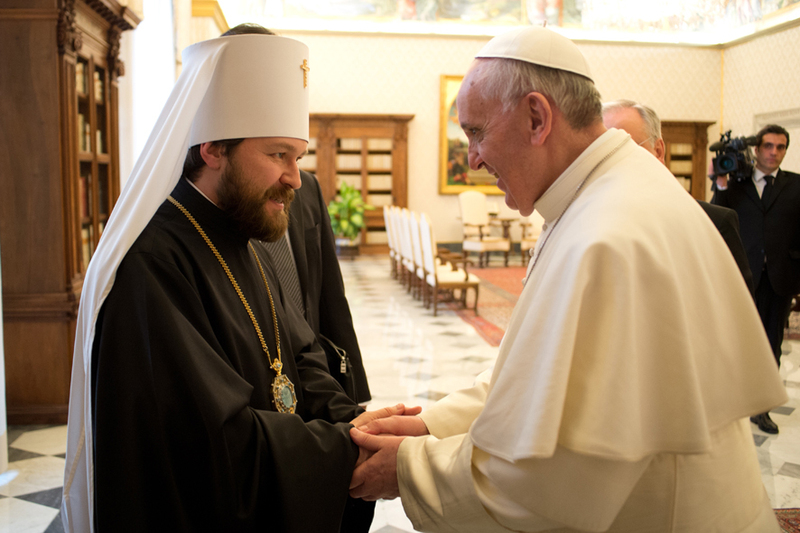 Metropolitan Hilarion, in Rome as a guest of the Youth Synod, met Pope Francis on Friday and Card Koch on Thursday, presenting the reasons for the break-up of the communion between Moscow and Constantinople. Moscow (AsiaNews) – Pope Francis received yesterday in the Vatican a Russian Orthodox delegation led by Metropolitan Hilarion (Alfeyev), head of the Department for Foreign Affairs of the Moscow Patriarchate. The meeting was held behind closed doors, and the Vatican Press Office did not release any official information concerning the content of the meeting. According to the statements on the eve, the Russian metropolitan came to see the Pope in order to explain the decisions of the Synod of the Moscow Patriarchate, which during its meeting on Monday in Minsk decided to suspend Eucharistic communion with the Patriarchate of Constantinople after the latter re-admitted Ukrainian bishops excommunicated by Moscow (Filaret Denysenko and Makarij Maletič). The Holy See has repeatedly stated that the question of the creation of a single autocephalous Ukrainian Orthodox Church is an internal Orthodox matter, which the Pope does not wish to assess. In his previous meeting with Hilarion in the Vatican on 2 June, Pope Francis had said that the Catholic Church would recognise only the Moscow Patriarchate in traditional Russian lands. This declaration was private, but websites close to the Russian Patriarchate made it public. Officially, Metropolitan Hiarion is in Rome on the invitation of the Synod of Bishops on Young People. However, on Thursday he met with Card Kurt Koch, president of the Pontifical Council for Promoting Christian Unity, and gave him the text of the Synodal decisions at Minsk. At the meeting, the two Church leaders formally discussed cultural collaboration between the Moscow Patriarchate and the Holy See. Since his arrival in Rome, the Metropolitan gave several interviews to the Italian press, defending Moscow’s positions vis-à-vis the Ecumenical Patriarchate of Constantinople. A concert was held in the Church of the Twelve Holy Apostles as part of the series The Russian Seasons, during which pieces composed by the Metropolitan Hilarion himself were performed. Speaking at the Synod of Bishops, Hilarion greeted the members gathered in plenary assembly on behalf of the Patriarch of Moscow Kirill (Gundyayev) and the entire Russian Orthodox Church. He also told them that the faith of the young and their vocation to Church service is today one of the most topical issues for all Christian denominations. Hilarion expressed the wish that the collaboration between Orthodox and Catholics would continue, citing the various initiatives of recent months, such as the "summer course" that for some years has seen priests and students from the two Churches take part in study sessions.